A couple of years ago, as best man for his wedding day, I planned a trip to Belfast for my best friend’s stag do. What a place! When planning, who-ever I spoke to always mentioned that I needed to make sure that I visit one particular place while we were out there: The Crown Liquor Saloon. Just a short walk away from the Europa Hotel, situated on Great Victoria Street, it wasn’t hard to see why it was so highly recommended! Originally opened as “The Railway Tavern” in 1826 by Felix O’Hanon, the pub was later bought by Michael Fanigan’s son Patrick in 1885 and the refurbishments that took place after the purchase is exactly what is present there now. The National Trust bought the property in 1978 and they have been restoring it sympathetically since, creating a true national treasure. The windows are the first sign of realising how remarkably precious the saloon is. 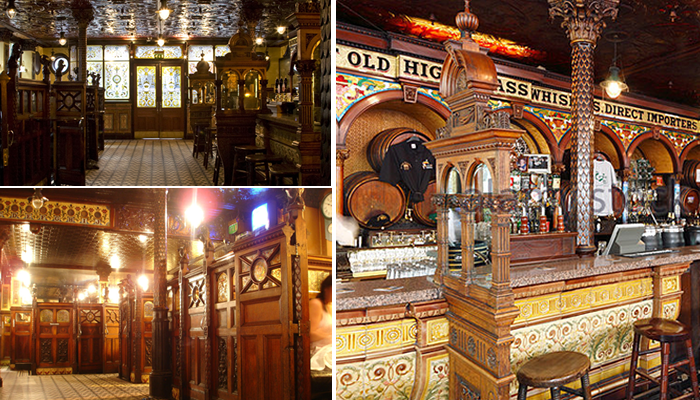 The entire pub is surrounded by large stained glass windows and the main entrance doors also have the same. The decorative patterns shine into the bar area, not only adding more decorative characteristics into the space, but also reflecting gracefully upon the other decorative details within the interior layout. Upon entry, it is difficult to know where to look first…! The stunning solid wood ceiling is covered in beautiful, attractive panels that consist of outstanding decorative carved patterns. The patterned effects transfer from the ceiling into the room via beautiful pillars, which are covered in carved “dragon scales” that are gilded. These patterns flow via the columns into the saloon’s seating areas. 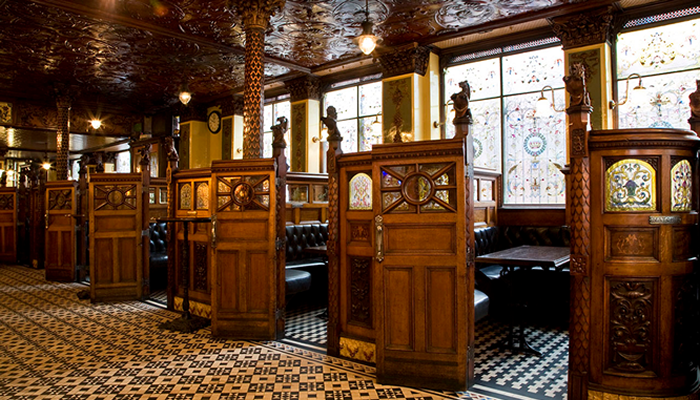 The seating arrangements within the pub mean you are able to sit within your own private booth area, just like our Victorian and Edwardian predecessors did. I don’t think they would have seen them as “VIP booths” like we did though! Each booth has its own door, with stained glass windows, which can also be closed if more privacy is wanted. Each doorway is “guarded” by carved dragons, complementing the scale effect on the pillars, honouring the Irish Celtic heritage and embracing mythology, a context that was incredibly popular throughout the Victorian period. Detailed wood carving surround the booth panels and stained glass windows continue to engulf each private space, almost creating a private temple. Leather seats have been placed within each snug, with authentic cast iron table bases holding solid wooden tops. They are each created with a gorgeous sense of decadence, complete with the original servants’ bell that still ring! The great detailing continues onto the main bar. 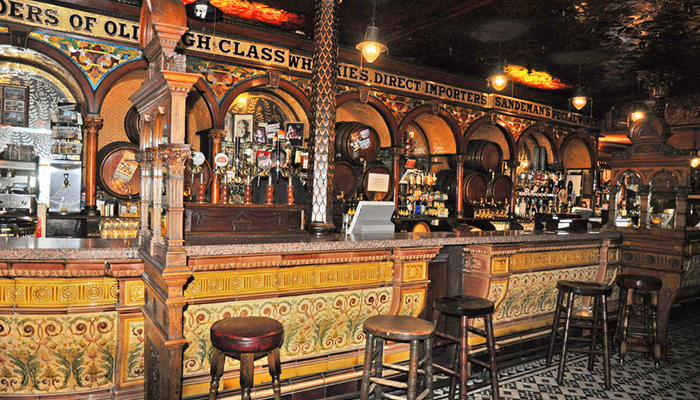 Original tiles surround the bar area with a “Balmoral Red granite” top resting upon them. The tiling not only shows off some fantastic, bright colours, but they also advertise what liquors they have to offer. Wooden framed “window panel displays” breakout the bar seating areas and have an East Indian design, a real reflection to the British Empire that was so prominent at the time of the build. The Victorian fairy-tale continues right through into the mosaic tiled floor. The colourful patterns are a striking reflection on the motifs present within the saloon. The stained glass designs are mirrored onto the floor with daylight and the carvings in the wood glide around you. It is almost like a dance of patterns that engulf you as you’re inside enjoying a pint of Guiness. The light fixtures are still lit by gas, with the smell still being prominent and you can definitely feel the heat that is given off them. When darkness arises, the subtle low lighting that shines through still ensures that the most can be made of the exceptional pattern interior masterpiece. 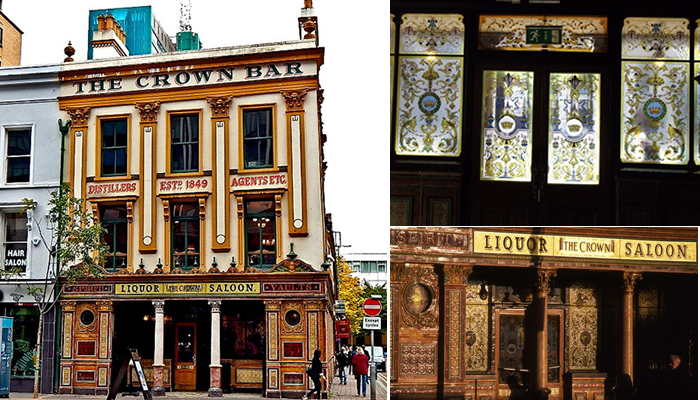 The Crown Saloon is not only a striking national feature that has also created a remarkable experience. The detail and history now creates an illusion of time travel and you certainly face a day that your ancestors would have seen as normal day life. A true 19th century Victorian architectural work of art that still exists in the 21st century. Truly wonderful.